Each graduate will be allotted six (6) tickets to the ceremony. The six tickets guaranteed for each student must be picked up at your high school between May 13 and May 17. They will be provided at no cost and seating will not be assigned. Children under three will be admitted without a ticket but will have to be seated on a lap. Lost tickets will not be replaced. Any graduate who will not be using all six allotted tickets is encouraged to give them to a graduate needing additional seats at the ceremony or turn them back into the campus to be redistributed. How do I request additional tickets? Between Feb. 11-22, families may submit a request for additional graduation tickets through an online request form. Please note – additional graduation tickets are not guaranteed. If by the deadline of Feb. 22 we are able to fill all ticket requests, you will be notified. If the campus has a shortfall, all requests will be subject to a random selection process. All families will be notified by March 1 if their request for extra tickets is approved or denied. If tickets are still available after working through this process, campuses will communicate how they will be distributed to graduates still needing more. What if I do not receive enough tickets for my family? 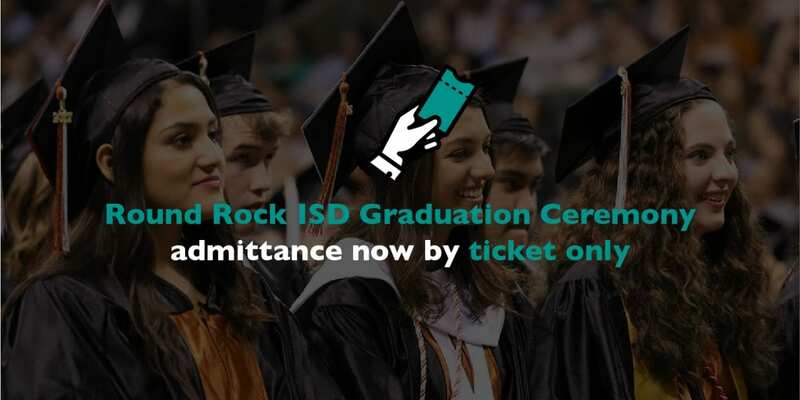 All five Round Rock ISD graduations will be live video-streamed on the Round Rock ISD website. Additionally, this year the ceremony will be streaming live at the Raymond E. Hartfield Performing Arts Center. All graduates’ guests are welcome to view the ceremony at this location. May I enter the ceremony without a ticket? No. Your ticket will be scanned upon entry. To expedite the entry process, please arrive early and do not bring bulky items. Tickets may not be duplicated nor can they be scanned more than once.